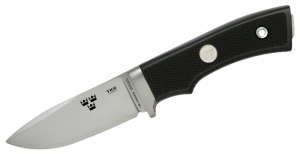 The TK6 is another great knife from the Tre Kronor series which can be described as a true quality knife for hunters. What sets it apart from other knives is its magnificent edge retention which is truly world class and really something special. The blade is made from the stainless laminated powder steel which is now quite legendary from Fallkniven and this combines incredible strength and great edge retention. There has never probably been another knife which holds up an edge better than the TK6L. You can also restore the sharpness to full functionality when this disappears by using one of the fine Fallkniven sharpening tools such as the DC3 and DC4 models which are fine diamond whetsones that really bring a knife to optimum sharpness with their fine diamonds. You should also ensure that the knife is kept as clean and as dry as possible and if it gets dirty during use it is useful to clean it by using some warm water and a little washing up liquid, wiping this off and then leaving it to dry for optimum performance. The TK6L has a total length of 6.9 inches so it is rather on the large side with a blade thickness of 3.15 inches which is quite thick and emphasise the workmanlike capabilities of this knife. Notwithstanding this rather thick blade, the knife is quite light at just 120 grammes while the steel is the nominal 3G with a Hardness edge of 62HRC. The TK6’s handle is made from the fabled Thermorun which is ideal for strong gripping and for use in wet and greasy environments. The beautiful sheath is a full cover black leather type which will protect your TK6L from any sort of harm or corrosion.